Over time, we tend to develop poor posture from daily activities like sitting at a desk, carrying a purse, and driving. 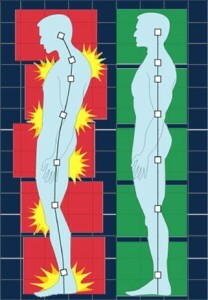 It causes back and neck pain and puts pressure on the spine. It can also cause fatigue and increase wear and tear on joints. Fortunately, having good posture is within our control. It is a matter of being aware of what our bodies are doing, strengthening our muscles, and developing good habits. A lot of people have jobs that require sitting at a desk. While sitting, practice aligning your neck, spine, and hips vertically. Take note of hunching shoulders and draw them back. Tuck your navel in and up to support the spine. There are also some posture improving tools you can use in the workplace. Try sitting on a balance or exercise ball instead of a chair. It gently rocks your pelvis forward, which increases your lumbar curve and pulls the shoulders back. It is best to have your computer monitor at eye level. You can also consider trying a lumbar support for your chair and an ergonomic foot rest to put your feet at the right height and angle. Poor posture develops as we get tired of being in one position. Take a break by standing, stretching, or walking. Avoid wearing high-heeled shoes, as they cause your spine and hips to rotate forward to achieve balance, causing misalignment and pressure. If you must wear heels, choose ones with a wider base (avoid stilettos) and no more than an inch and a half in height. There are a number of exercises designed to help improve posture. They tone the muscles that naturally pull back your shoulder blades, as well as strengthen your core and back muscles. Having these muscles strengthened will help to naturally hold your posture in place without having to think about it. Check with your primary care physician or physical therapist for exercises you can do at home. If you like to take classes, Yoga, Pilates, and Core Fitness programs use slow, controlled movements to target your core. 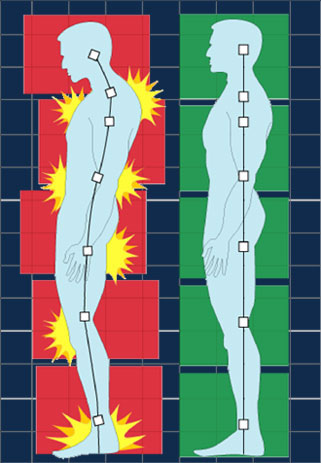 With practice, you will be able to gradually replace your old posture with a more energizing, revitalizing posture!